DROMAEOSAURUS ALBERTENSIS - CRETACEOUS MONTANA U.S.A.
Dromaeosauus albertensis Matthew & Brown 1922. 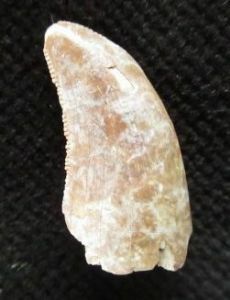 Carnosaur tooth. Matrix free. Serrated along both edges. The serrations on the outer edge are on a curve. On the inner edge they are straight. Lovely condition and rare. Upper Cretaceous, Late Campanian, Judith River Formation.